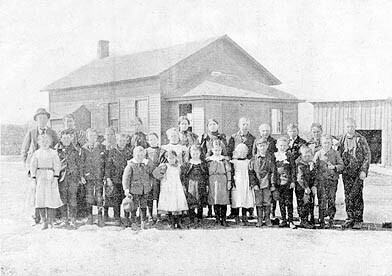 This photo appeared in the September 14, 1898 The Stillwater Gazette (weekly), part of the “Our County Public Schools Series” column (see this issue for a detailed history of the school district up to that time). DISTRICT FORMED Sometime around 1852. GENERAL LOCATION Northeastern part of the town of Stillwater. DISTRICT BOUNDARIES Territory to the northeast of Stillwater, bordering the St. Croix River. Originally the district was quite large, encompassing much of the northeastern part of the county, but was divided in 1862. “The first school held in this neighborhood now district No. 4, was at Arcola on section 31, range 19, town 31. The territory out of which district No. 6 was formed, came principally from the Arcola district. This change was made in 1862…” A term of school was taught prior to the formation of the district during the winter of 1861 at the home of Cornelius Lyman, Sr. The school built soon after the formation of the district in 1862 was burned during the fall of 1870. Another school was built on the same site in 1871. First school building burned down in 1870. 35 students were enrolled in 1897.